Please join us for an event to mark the completion of new parking, access and station improvements. It will be held on Wednesday, February 15 at 10 AM at the new station plaza area. The new parking facility will open on Thursday, February 16. 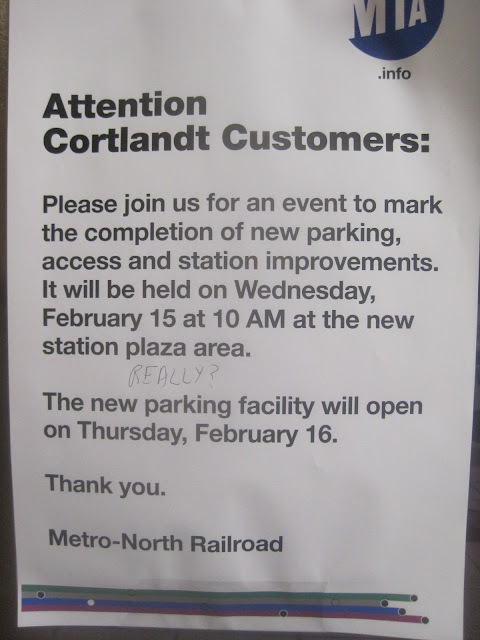 Darn..., most customers at Cortlandt are commuters and I hardly believe, that there are many commuters around 10 AM in the morning left to celebrate - so all the guys who suffered from the station work, are invited but most likely not there. Aergerlich aber was will man machen. Ich habe um 9 Uhr frueh einen Termin in der Stadt und kann leider nicht hin. Also: Freuen wir uns, dass das endlich fertig ist.